A new feature at Bandmark: Each Monday we’ll be scouting out the best of local music here in Montreal. This city is the undisputed cultural capital of Canada, and contains more brilliant bands than we could catalogue even if we did this feature five times a day. First up we have The Unsettlers, who came to our attention during their recent performance at Osheaga 2010. Though Osheaga featured such luminaries as The Arcade Fire, Metric, Weezer and other favourites of the Pitchfork crowd, The Unsettlers couldn’t be further away from the slick hipster rock of those acts. Occupying the Trees Stage while The Arcade Fire set up on the main stage, The Unsettlers’ act was unjustly ignored at Osheaga. Well, we can’t turn back time, but we can turn up the volume on this awesome band. They deserve it. 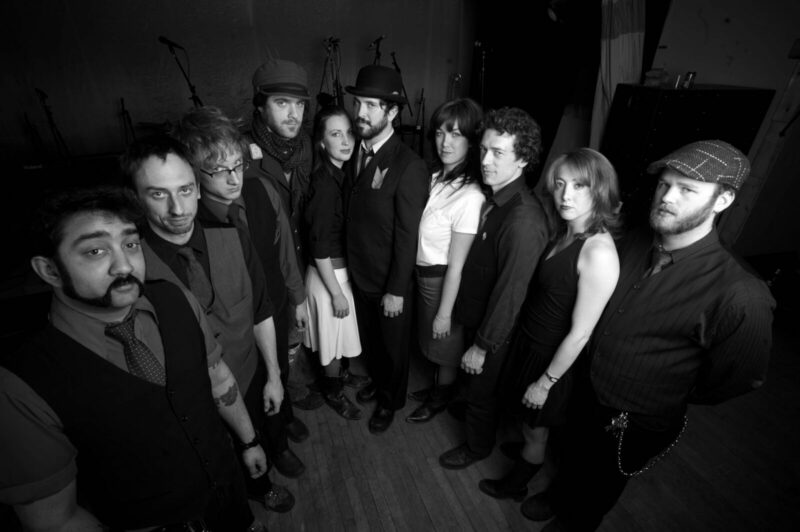 According to the Unsettlers’ blurb on their MySpace, the 11-piece ensemble “specialize in funeral dirges for the living, dark polkas, menacing waltzes and horse-drawn lullabies, all filtered through the creaking floorboards of a whiskey soaked saloon.” Sounds good, right? In practice, the band crosses genres at a whim, and their sound can’t be easily pegged — a fascination for early 20th century music is in evidence, mixing everything from Appalachian mountain folk to Weimar cabaret to the Depression-era dust bowl countryside. While it might sound gimmicky on paper, The Unsettlers bring genuine pathos and atmosphere to their lurching, Vaudeville-broke-down sound. The gruff vocals of B.W. Brandes, channeling Tom Waits, barks and howls while pretty female voices warble in the background (in shades of Decemberists). Clattering ragtime pianos, clarinets, trumpets, glockenspeils… all festive yet melancholy, like a square-dance at a funeral. The Unsettlers are becoming known for their live shows, which feature sword-swallowers and other carnival-esque antics. It’s only a matter of time before these guys blow up big — better enjoy their small, local club concerts while you can! Check out the Unsettlers’ Myspace, enjoy their twisted tunes, and be sure to scout out their debut album, available in certain forward-thinking record shops.